The Juniper Pond Fountain has an effortless broad upright spray, that opens modestly in a small circle. 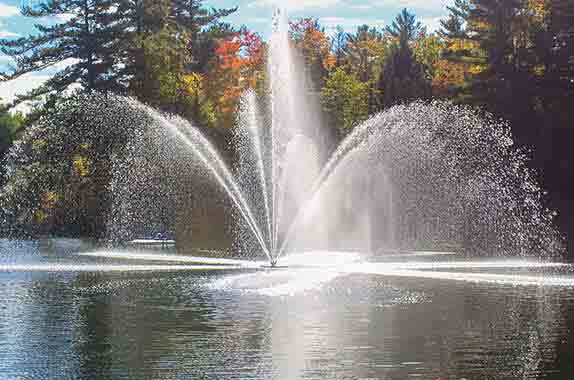 Its contemporary pattern makes it the perfect lake fountain for narrower ponds/ lakes! The Juniper Pond Fountain has an effortless broad upright spray, that opens modestly in a small circle. Its contemporary pattern makes it the perfect Pond fountain for narrower ponds/ lakes! This Made in Canada floating pond fountain is sure to capture plenty of attention! All Juniper Pond fountain models are powered by a stainless steel; water cooled/ water lubricated submersible motor and stainless steel submersible pump. Your done. Time to enjoy the view!